A good Maths tutor will care about Maths, understand its importance and have a belief in its value and place in society. They will appreciate the value and benefits of learning about Maths and the positive effects it can have on cognitive development. A good Maths tutor will be able to share with their students why Maths is important, and demonstrate their enthusiasm for it. A good Maths tutor will understand that students develop at different rates, and that confidence and a positive state of mind are central to this. They will create a leaning environment where students’ well-being is valued and where the way in which students work is as important as the results of that work, and where progress is just as valued as attainment. A good Maths tutor will know that students come to an understanding of mathematical concepts at different speeds, and will be able to recognise a student’s level and depth of understanding at any given time. They will tailor work and tasks so that the degree of a student’s understanding is accommodated, while at the same time ensuring that their learning is being advanced. 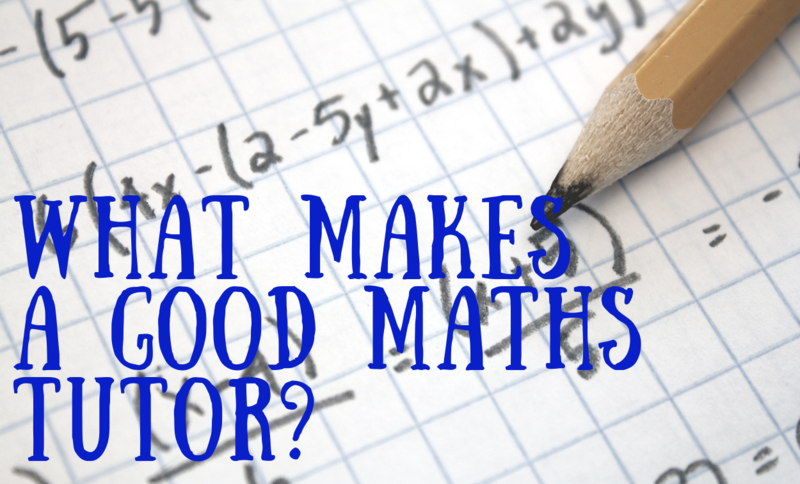 A good Maths tutor will understand—better than most—that Maths can be hard sometimes, and that concepts and new ideas can’t always be grasped straight away. Sometimes, a lot of repetition is required and new methods may need to be taught a number of times before a student is confident is using them. Patience is therefore one of the Maths tutor’s greatest virtues, and they will always be prepared to take the time to allow new learning to be consolidated. A good Maths tutor isn’t afraid to go beyond the conventional to achieve the goal of helping their students to understand. Sometimes it may be necessary to think outside the box and bring in seemingly ‘unmathematical’ concepts in order to facilitate learning. This means that a good Maths tutor should be prepared to be adventurous and innovative, and willing to use examples and concepts from the real world—beyond Maths— to make it more comprehensible and able to be absorbed. A good Maths tutor will understand what their students can do and what they can’t do. They will know where their strengths and weaknesses lie, and tailor work accordingly. In addition, they will know how students learn, and how best to teach new concepts to them most effectively. They will also have a clear understanding of what their students are good at, and will find ways to build on their attainment so as to challenge and stimulate them.